It’s been close to 20 long years since giant pandas have been at the Toronto Zoo. The last time these beautiful and iconic animals were at the zoo it was only for a three-month period during the summer, but this time these two giant pandas will be at home at the Toronto Zoo for 5 years, possibly longer if they breed, and then 5 years at the Calgary Zoo in Alberta, Canada. I arrived early to the zoo, as the Toronto Zoo doesn’t open to the public until 9:00am during the term of the panda’s visit members can visit them an hour before the zoo opens. 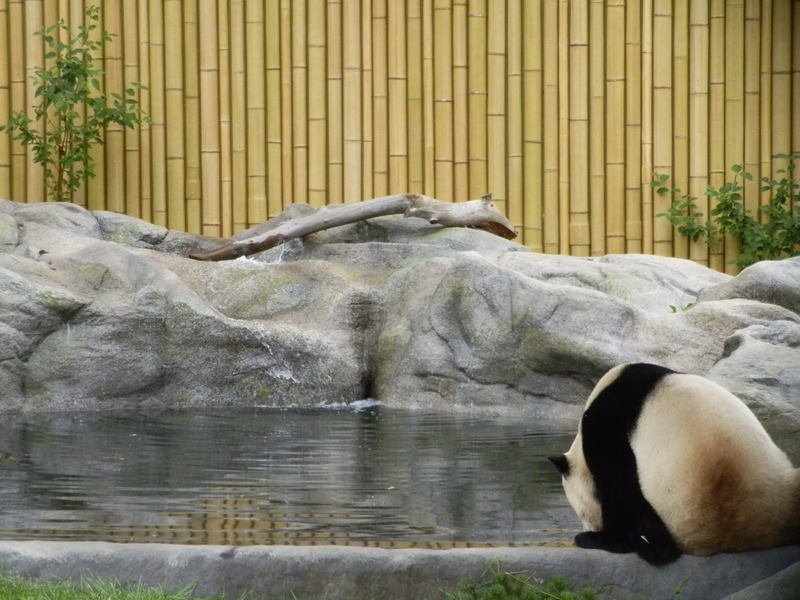 Being a member and Lady of the Zoos I was eager to see and meet these two giant pandas. As I entered the zoo with “The Circle of Life” playing from the speakers, I made my way to the entrance to the Giant Panda Experience. Walking through the panda gate you are first introduced to how these precious creatures made their way from across the world in China to their new home here at the Toronto Zoo. With the great help of FedEx, the two giant pandas were taken from Chengdu, China on an 18 hour journey that covered some 12,875 kilometers (8,000 miles) to Toronto, Canada. 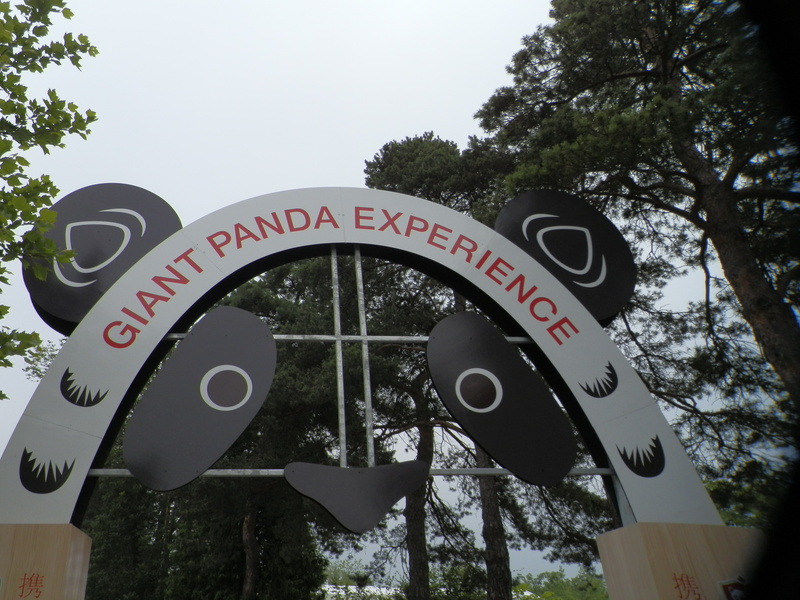 The trail then leads you into the expansive Giant Panda Interpretive Centre that is full of information on giant pandas as well as interesting interactive exhibits. 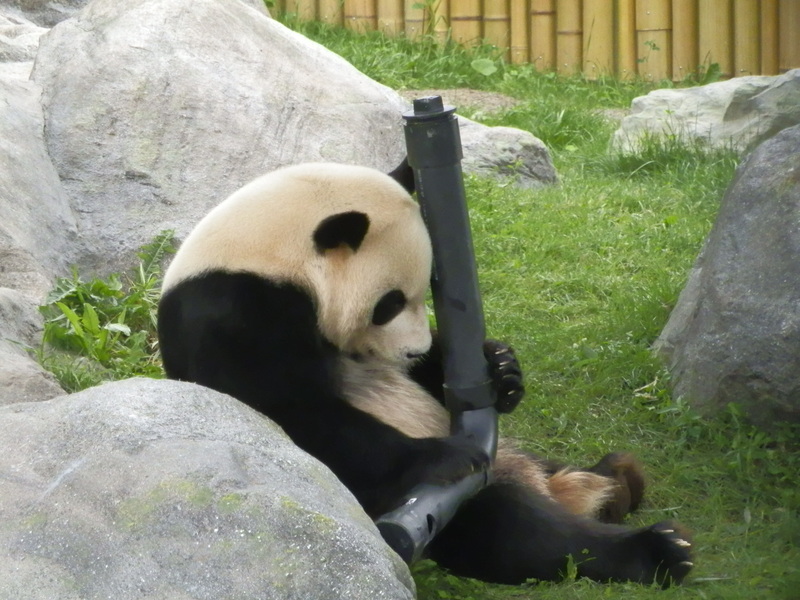 Here I learned that giant pandas eat 42 to 64 kilos a day of bamboo, bamboo making up 99% of their diet. 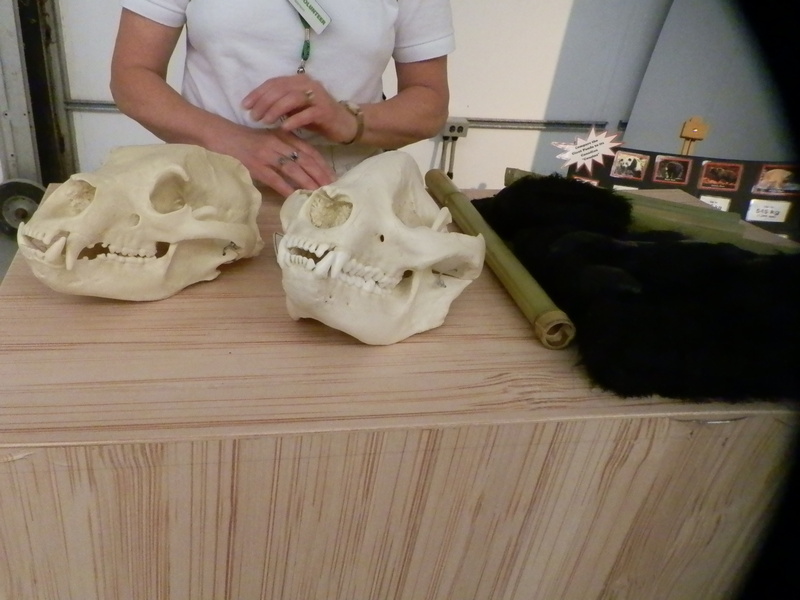 I also met with a kind and knowledgeable lady at a touch table where she showed me a skull of a giant panda and explained how it had evolved to live where it does as well as eat and digest the bamboo it eats. She also explained how giant pandas evolved a pseudo-thumb, which is really an extension of their wrist bone, enabling them to grip the bamboo. Throughout the center giant pandas are compared to black bears, from skulls to their home ranges, where black bears have a home range of 20 to 155 square km unlike the giant panda that’s home range is only 5 to 15 square km. There were also touch screen displays of the bamboo forests where you are encouraged to pan through the forest to look for pandas hiding in the habitat. 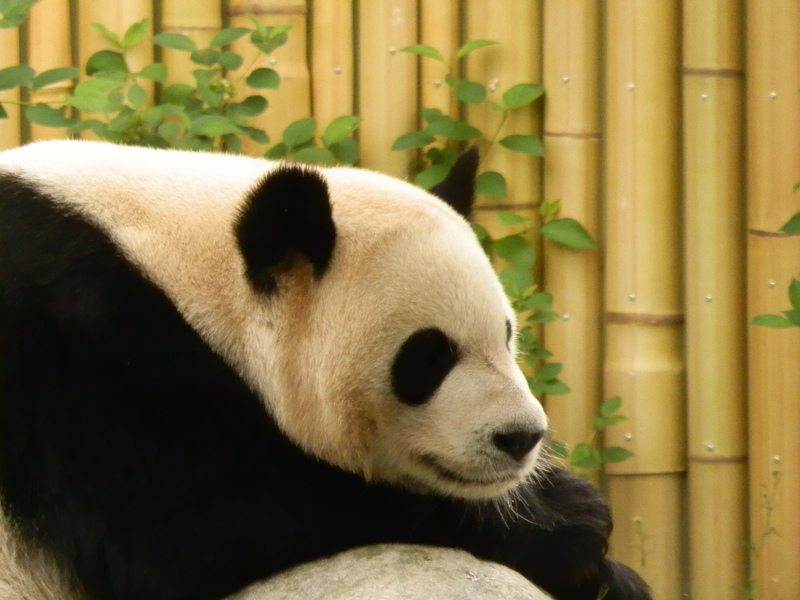 There are over 60 reserves in China where the remaining 1600 giant pandas live and are protected. There was also a display that I found important, that showed some of the various types and uses of bamboo and helps to drive home the fact that bamboo is a great renewable resource that more people should be aware of. I was also surprised and excited to see an exhibit that would soon be the home to Chinese giant salamanders, another critically endangered species. 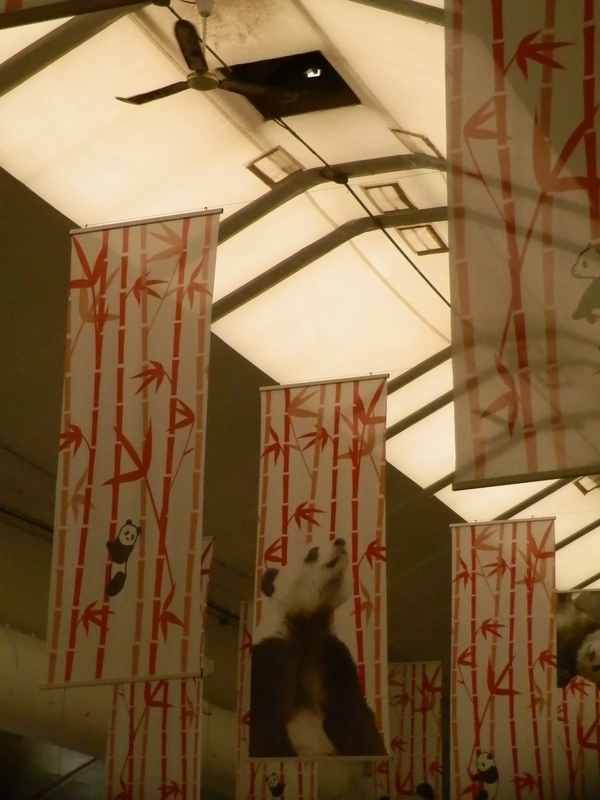 A simulated bamboo forest, with sounds of various species and visuals of the many animals that share the bamboo forest with giant pandas, leads you to the next section of the Giant Panda Experience. Next are the south (outdoor) viewing yard, followed by both the indoor exhibits and then the north (outdoor) viewing yard for the giant pandas. First I met Er Shun, the almost 6-year-old female, who was having her morning siesta in her indoor enclosure. Then I headed to the north viewing yard where I was happy to meet the very much awake Da Mao, the almost 5-year-old male. The crowd of us were thrilled to watch him fiddle with and turn his enrichment device, a large L shaped pipe with small holes filled with food treats. 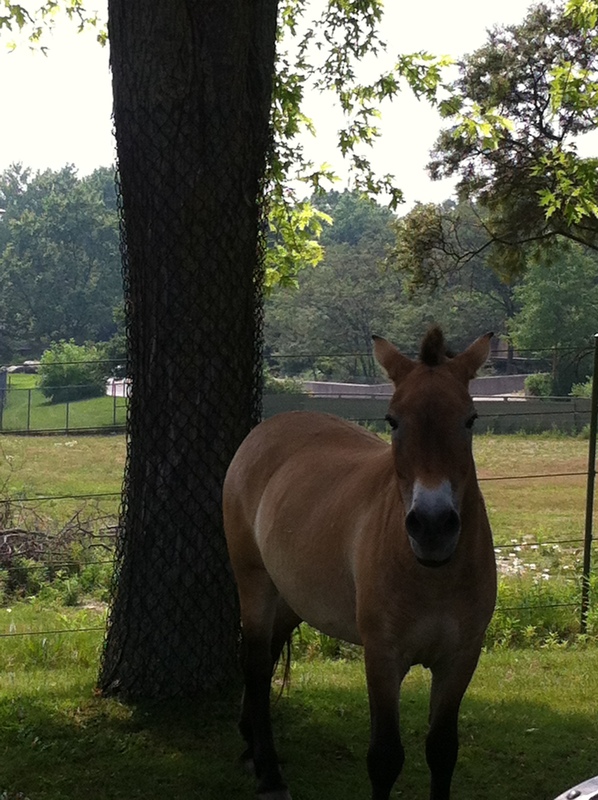 Then after a drink to wash down his treats he climbed up on a rock surrounding his pool, to lay down. When I enquired about unique personalities or behaviours of the pandas from a zookeeper, she mentioned that strangely the female sometimes does somersaults while the male was overall much more playful and more interested in training sessions. On top of the excitement of the Giant Panda Experience I was also in for a big surprise as at the end of the day after a tour of the zoo and the “Hangout for Orangutans” talk I decided to take a ride on the Zoomobile (free for members) which takes you around the zoo on a backstage pass. 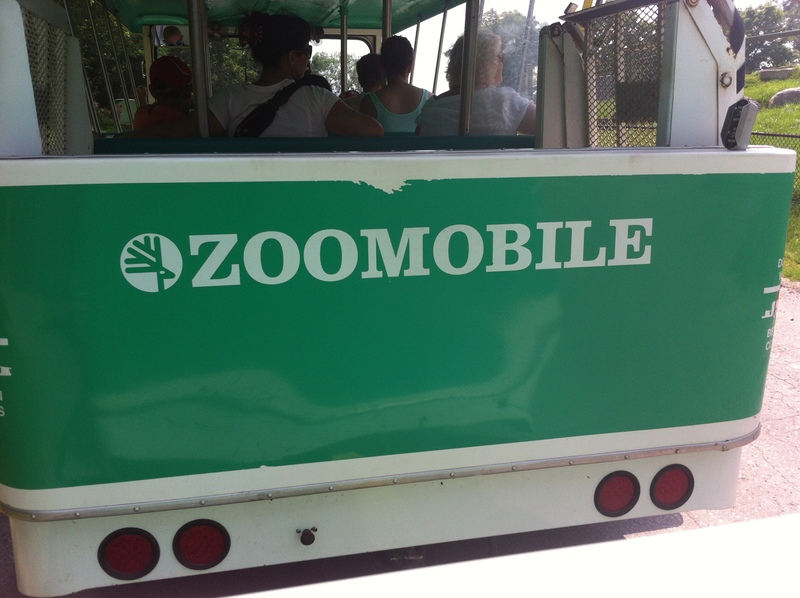 On the Zoomobile, an open train-like tram, you’ll see different views of exhibits like the guar, elephants and cheetahs as well as the health center and green house. Before the Zoomobile would take you around the outer portion of Eurasia to glimpse some of these animals, but with all the changes due to the Giant Panda Experience as well as construction on the Eurasia exhibits to improve the animals’ habitats as well as viewing experiences for visitors there is a change to the Zoomobile ride that even only in its beginning stages, it here turns into a sort of safari type experience. This was a pleasant and complete surprise to me and boy was I excited! The Zoomobile takes you into the enclosures of Przewalski’s horses, the Toronto Zoo’s all female herd are all around grazing while one even crossed the path to scratch on a tree and stand beside us as we drove by, next was the domestic yaks, who were relaxing in the heat of the day. There will soon be more animals seen here like the mouflon and Bactrian camels. Between the Giant Panda Experience and the Zoomobile’s new safari addition as well as all the other amazing animals and enriching exhibits make Toronto Zoo a must see zoo to visit! Actually it was 1985 when we had the Giant pandas, the following year we had a pair of Golden monkeys that I looked after. Enjoy your site, I also have toured many Zoos, my total at the moment is 252 in 29 countries and worked in 19 facilities in 9 countries. Thank you so much Wayne for your comment! Would love to hear more about your travels, favourite zoos and animal experiences! If you would like, I can send you a list of the places I have visited, worked at, slept in, areas worked in and species worked with! I have been working on a book for a number of years and last winter started a section on the early days at the Metro Toronto Zoo, including quarantines, holding areas and species that never arrived at the zoo or never made on exhibit! Wayne that would be fabulous! Thank you so much! I’d love to learn more from you! Great to hear, I love our male, he’s so playful!